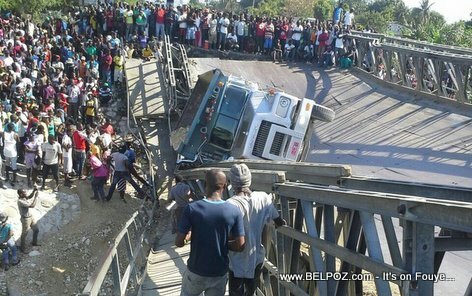 KREYOL: Haiti - Pont Route Neuf la EFONDRE matin Vendredi 18 Mars 2016 la... Kisa ou panse de sa??? There should be scales installed to determine the weight of the trucks before crossing and secure underneath of it so people do not steal the bolts that secure the bridge. This bridge was not a strong bridge.